Digital signage is the newest method of advertisement to both small and big sections of viewers, such as, schools, banks, hotels and malls. It is a highly useful medium to share and display vital information in different formats across a wide range of audience. Moreover, Digital Signage technology cuts down the cost of advertising, because print media is no longer in use, i.e., businesses no longer need to get brochures and pamphlets printed. This is in turn reduces the labor to a significant level. No wonder, today the Digital Signage technology is taking the world by storm. The conventional advertising methods were based on one or two types of content formats, such as pamphlets and brochures, and these did not result in reaching out to a diverse populace. However, now businesses and brands can have multiple content formats, and all of these formats can be displayed on a single screen only. This means that anything from texts to videos can be shown on one output medium, i.e., monitors and screens. So now you can print brochures or catalogues and email them as well to the target audience in your network. To capture the attention of your target audience, you can use different content formats, such as, text, image, video or flash animation. Thus, you are no longer restricted to printed pages (print media) alone; you can connect with a larger audience through a video or a documentary on your company’s image and products. Digital Signage network shares the live feeds on social network sites, such as, Twitter, FaceBook and YouTube. And this means that you always have latest and colossal amounts of relevant data to share with your audience on the globe. One of the best features of Digital Signage network is that it can be updated with the help of a button. No more do you have to pin pages to the notice boards. Whatever new information is available you can just update the system and that will be instantly showcased. This makes the process of data updation really quick and easy. You will no longer have to go through the huge and expensive process of adding workflow processes that includes editing, printing and distributing. 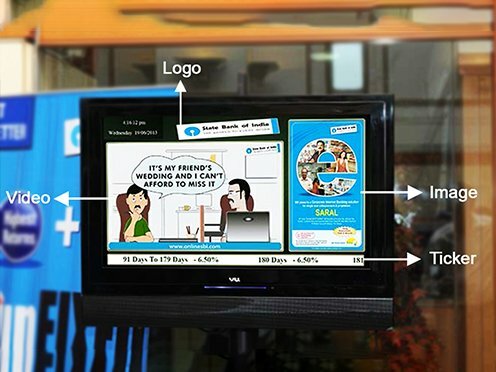 These factors have made the Digital Signage network highly efficient and really easy to use as a medium of advertising. Through one principle computer you can control the information on the screens or the monitors.